Происхождение ресурса - это запись, описывающая сущности и процессы, вовлеченные в создание и доставку или иное воздействие на ресурс. Происхождение обеспечивает необходимую основу для оценки подлинности, возможности доверия и воспроизводимости. Утверждения о происхождении имеют форму контекстуальных метаданных и сами могут стать важными записями со своим собственным происхождением. Заявление о происхождении показывает клиническую значимость с точки зрения уверенности в подлинности, надежности, достоверности, целостности и стадии жизненного цикла (например, Document Completion - имеет артефакт юридической проверки подлинности), каждое из которых может повлиять на политики безопасности, конфиденциальности и доверия. The Provenance resource tracks information about the activity that created, revised, deleted, or signed a version of a resource, describing the entities and agents involved. This information can be used to form assessments about its quality, reliability, trustworthiness, or to provide pointers for where to go to further investigate the origins of the resource and the information in it. Provenance resources are a record-keeping assertion that gathers information about the context in which the information in a resource was obtained. Provenance resources are prepared by the application that initiates the create/update etc. of the resource. An AuditEvent resource contains overlapping information, but is created as events occur, to track and audit the events. AuditEvent resources are often (though not exclusively) created by the application responding to the read/query/create/update/etc. event. Many other FHIR resources contain some elements that represent information about how the resource was obtained, and therefore they overlap with the functionality of the Provenance resource. These properties in other resources should always be used in preference to the Provenance resource, and the Provenance resource should be used where additional information is required, or explicit record or provenance is desired. The relationship between a resource and its provenance is established by a reference from the provenance resource to its target. In this way, provenance may be provided about any resource or version, including past versions. There may be multiple provenance records for a given resource or version of a resource. The Provenance resource is based on the W3C Provenance specification , and mappings are provided. The Provenance resource is tailored to fit the FHIR use-cases for provenance more directly. In terms of W3C Provenance the FHIR Provenance resource covers "Generation" of "Entity" with respect to FHIR defined resources for creation or updating; whereas AuditEvent covers "Usage" of "Entity" and all other "Activity" as defined in W3C Provenance. Entity - An entity is a physical, digital, conceptual or other kind of thing with some fixed aspects; entities may be real or imaginary. Agent - An agent is something that bears some form of responsibility for an activity taking place, for the existence of an entity, or for another agent's activity. Activity - An activity is something that occurs over a time period and acts upon or with entities. It may include consuming, processing, transforming, modifying, relocating, using, or generating entities. The Provenance resource corresponds to a single activity that identifies a set of resources (target) generated by the activity. The activity also references other entities (entity) that were used and the agents (agent) that were associated with the activity. To record multiple activities that resulted in one (target), record each (activity) in independent Provenance records all pointing at that (target). The Provenance resource depends upon having References to all the resources, entities, and agents involved in the activity. These References need not be resolvable. The references must provide a unique and unambiguous identification. If a resource, entity, or agent can have different versions that must be identified, then the Reference must have versioning information included. The Provenance resource is based on leveraging the W3C Provenance specification to represent HL7 support of provenance throughout its standards and explicitly modeled as functional capabilities in ISO/HL7 10781 EHR System Functional Model Release 2 and ISO 21089 Trusted End-to-End Information Flows. Mappings are provided. The Provenance resource is tailored to fit the FHIR use-cases for provenance more directly. In terms of W3C Provenance the FHIR Provenance resources covers "Generation" of "Entity" with respect to FHIR defined resources for creation or updating; whereas AuditEvent covers "Usage" of "Entity" and all other "Activity" as defined in W3C Provenance. When used in a document bundle, the references are often not explicitly versioned, but they always implicitly pertain to the version of the resource found in the document. On a RESTful system, the target resource reference should be version specific, but this requires special care: For new resources that need to have a corresponding Provenance resource, the version-specific reference is often not knowable until after the target resource has been updated. This can create an integrity problem for the system - what if the Provenance resource cannot be created after the target resource has been updated? To avoid any such integrity problems, the target resource and the Provenance resources should be submitted as a pair using a transaction. The Provenance resource includes a signature element (digital signature) which can be used for standards based integrity verification and non-repudiation purposes. The Signature datatype provides details on use of the signature element. The Signature.type coded value of "Source" should be used when the signature is for simply proving that the resource content is the same as it was when the resource was updated or created. A Provenance record can be recorded to indicate who deleted a Resource. If versioning is supported, the version that was deleted is referenced in Provenance.target; if versioning is not supported then Provenance.target contains the non-version reference. Provenance.entity is not used unless there is a business requirement to do so. 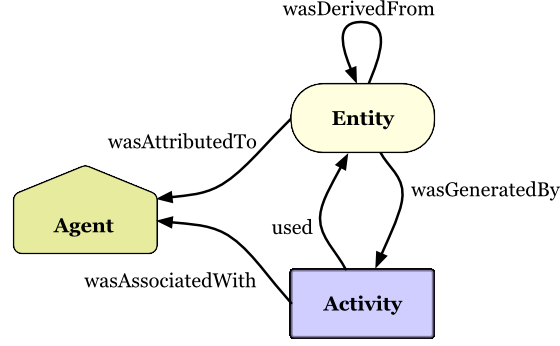 Provenance can be used to record activities of an automaton that transforms input. Such as middleware that extracts information from a HL7 v2 message and creates FHIR resources, or middleware that extracts information from an HL7 CDA document and creates FHIR resources, etc. The Provenance in these cases is recording the activity of the middleware. The middleware in this case would, in addition to creating the target resources, create a Provenance resource that indicates all the target resources (using Provenance.target). The middleware is identified as one of the Provenance.agent elements, with the Provenance.agent.role of assembler. The middleware may record the source as another Provenance.agent element. The original content is optionally saved. This might be as a DocumentReference, or Binary. The Provenance.entity would then point at this original content. The original source might include some form of 'provenance' to cover the history of the original content prior to the import transformation. This original source 'provenance' should be converted into FHIR Provenance records as appropriate.